Let us assume that there exists some ratio of two whole numbers H/L which represents the proportion we seek, exactly. Let us further assume that this ratio is in simplest form, such that H and L share no common factors. What can we know about H? According to the Pythagorean Theorem, we know that the square on the Hypotenuse is equal to the sum of the squares on the Legs. We also know that adding a number to itself, regardless of whether that number is odd or even, always yields an even sum. Therefore, since the squares on the Legs are equal, we know that the square on the Hypotenuse must be an even number. And since the square root of an even number is always even, we know that the Hypotenuse, itself, must be an even number. What, then, can we know about L? 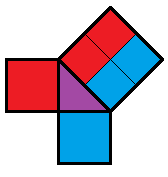 Since we know that the square on one of the Legs is equal to half of the square on the Hypotenuse, we can know that the square on the Leg must be an even number, as well. After all, dividing an even square number by 2 always yields an even number. And, again, if the square on the Leg is even, its root must also be even, so we know that the Leg is an even number. However, if both H and L are even, they must share a common factor of 2. Since our initial assumption was that our ratio, H/L, was in simplest form, we have reached a contradiction. A ratio cannot be in simplest form if its constituents share common factors. We can therefore conclude that there exists no ratio of whole numbers which can represent the proportion of the Hypotenuse to the Leg of this triangle. That proportion must be Irrational.